Absolutely Optical uses the latest computerized technology to make sure your prescription eyeglasses and prescription sunglasses are made promptly and accurately. All prescription eyewear is actually verified by a doctor before you receive it. Our board certified Optometric Physician, Dr. Jay Weil, has over 30 years of experience. 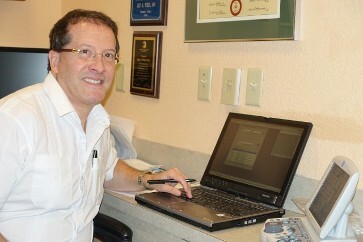 He uses the latest computerized technology in testing the eyes carefully for glasses or contact lenses. The doctor also treats patients with eye conditions such as glaucoma, infections, foreign bodies, or dryness of the eyes. We offer the largest selection of designer eyewear. We represent over 60 designers of fine eyewear and sunglasses. There are over 3,000 choices in stock on any given day. Some of our clients feel more comfortable choosing glasses in the comfort of their own home, office, or hotel. We offer our off-site shopping service to fill just this need. Call Absolutely Optical and answer a few questions regarding the type of eyewear you are in need of. We can then schedule an appointment for when it will be convenient to visit with your own personal assortment. We can improve the vision of a person's eyes without resorting to surgery... and at about half the cost. The process involves the use of a series of computer designed contact lenses that gently and gradually reshape the cornea. In a matter of weeks you will be seeing clearly throughout the day without the dependency on glasses or the contacts. We are now affiliated with Tampa's leading centers for laser vision correction. There are now various types of computer controlled lasers which can reshape the eye's cornea correcting for a wider range of visual problems. There are even "Custom LASIK" procedures utilizing the latest wavefront technology. This technology corrects subtle types of aberrations of the visual system that even glasses cannot correct. Contact us today to learn how a new set of eyeglasses can improve your vision and outlook on life.